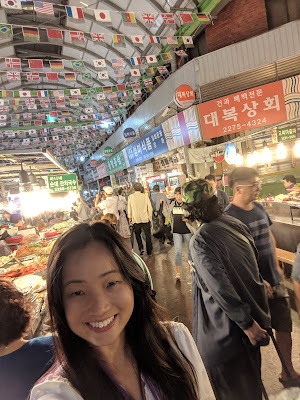 Today, I am going to talk about eating at the famous Gwangjang Market loved by locals and tourists, late night shopping at Dongdaemun and the most enjoyable experience in my entire Seoul trip - Korean Traditional Spa! 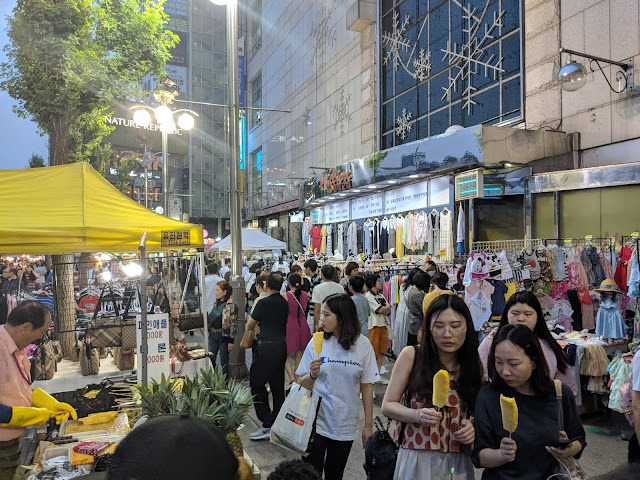 Both Gwangjang Market and Dongdaemun are accessible by Metro via the blue line and they are just one stop away from each other. 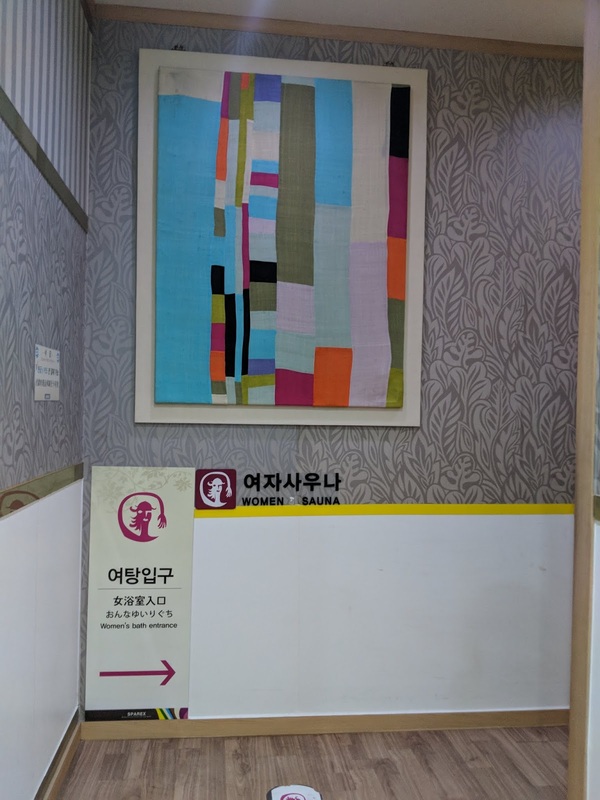 The Metro station for Gwangjang Market is Jongno 5; the metro station for Dongdaemun is Dongdaemun. 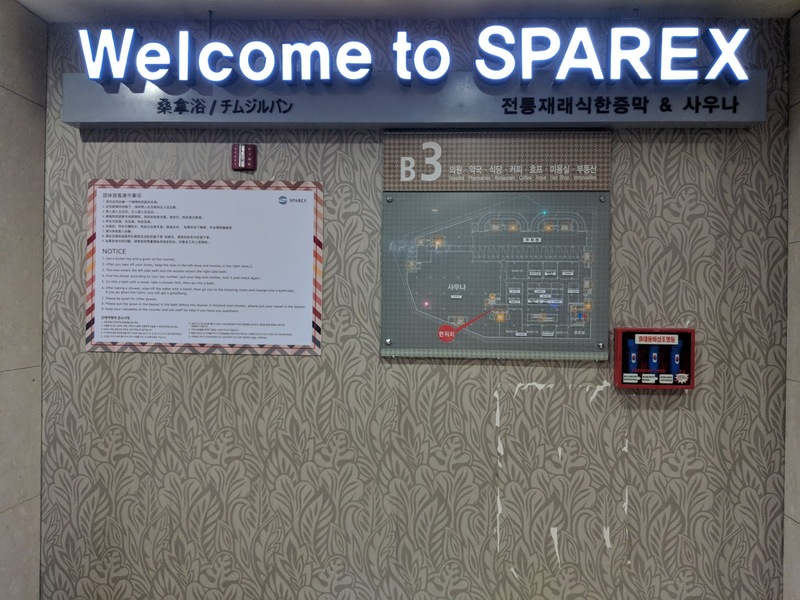 There is a Korean Traditional Spa called Spanex located right at Dongdaemun! Therefore, you can eat at Gwangjang, explore Dongdaemun and relax in the spa! 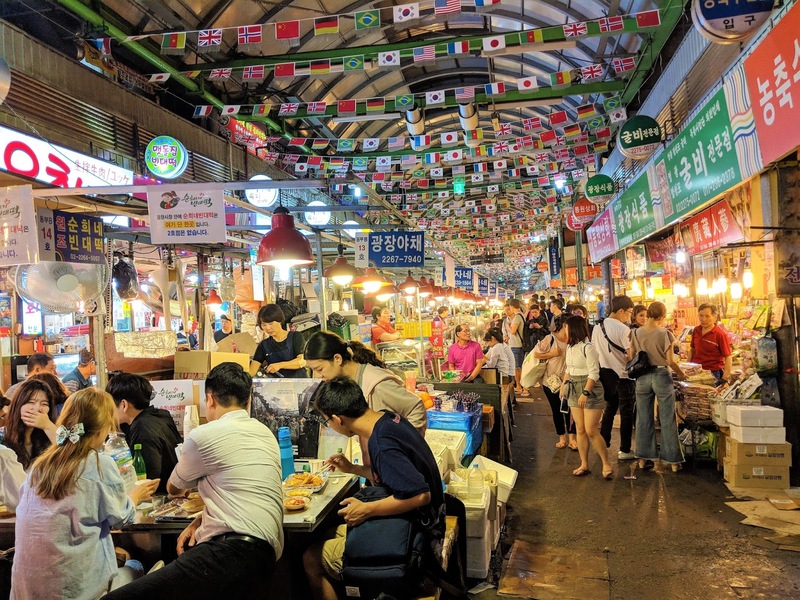 Gwangjang Market is known to be the oldest functioning market in Seoul. 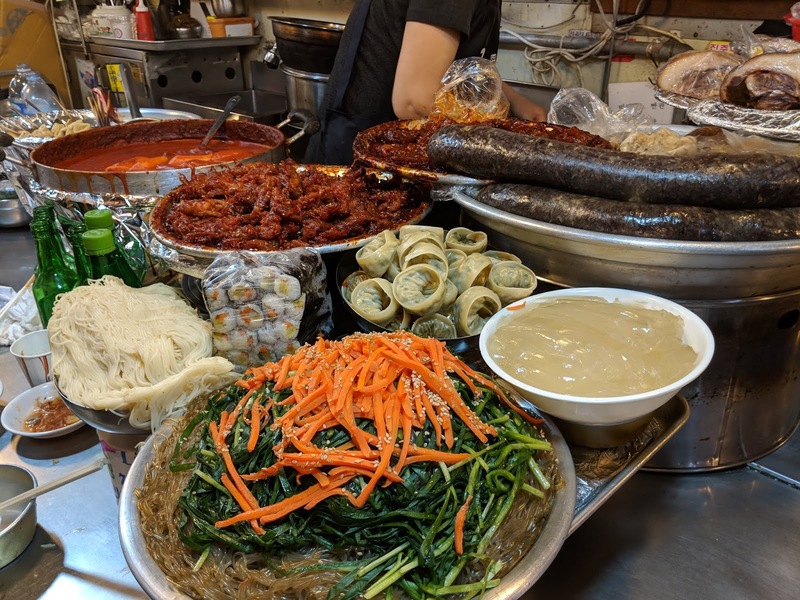 I just asked a Korean where she would eat street food and she also recommended Gwangjang Market. 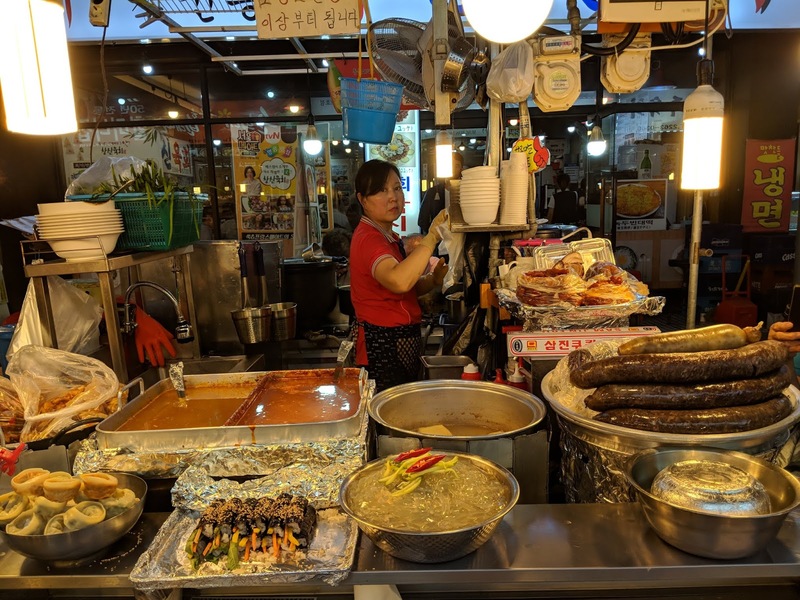 When I arrived at the market, indeed, I saw and heard many Koreans enjoying their food with beer or Soju after a day of hard work. Interestingly, this chilling out after work culture is still not evident in Singapore, especially when you are in your late thirties and the place you wana chill is probably home. After my travels, I realised that it is important to chill out even if it is for a short while after work. The breath of fresh air will make a lot of difference in your mind, your spirit and your demeanor. At Gwangjang, there were many food stalls with seats for people to chill out. 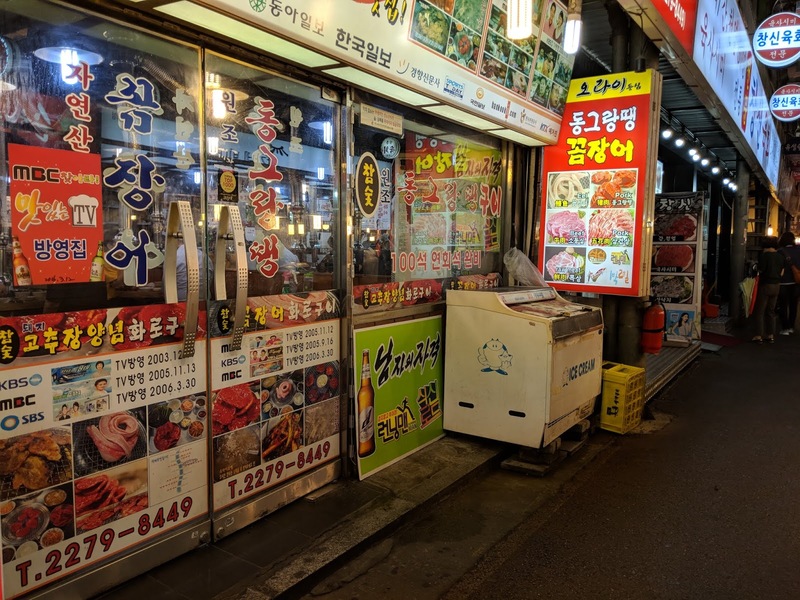 This is very different from Myeongdong, whereby I had to stand to eat. 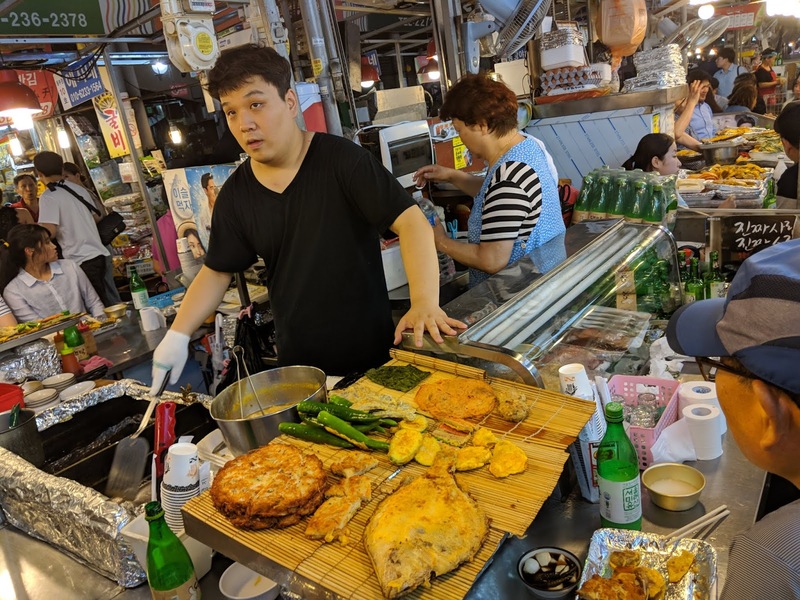 What to eat at Gwangjang Market? 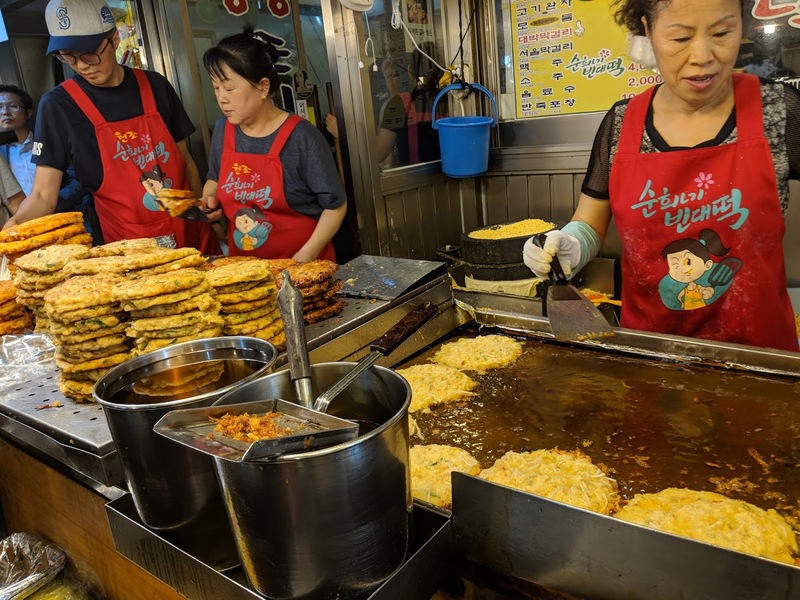 Apart from the usual street food that I saw at Myeongdong, one type of food stood out at Gwangjang Market and that was Korean Pancakes with Leeks and Mung Beans! Leeks is a type of vegetables and is supposed to have amazing health benefits for the body especially for the heart. Click here to check out the health benefits! 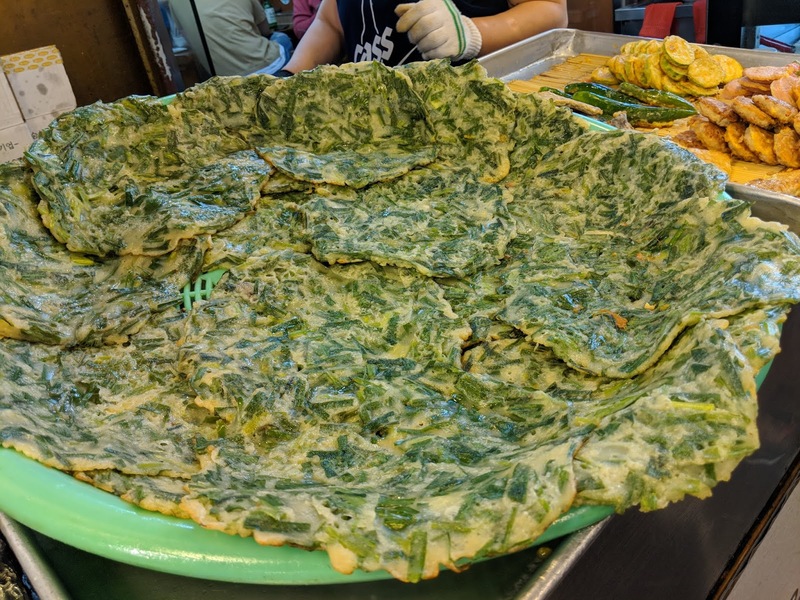 There were many stalls selling Leeks Pancakes. Mung Beans resemble beansprouts. Click here to check out 10 amazing health benefits when you eat Mung Beans! I must try one for myself! 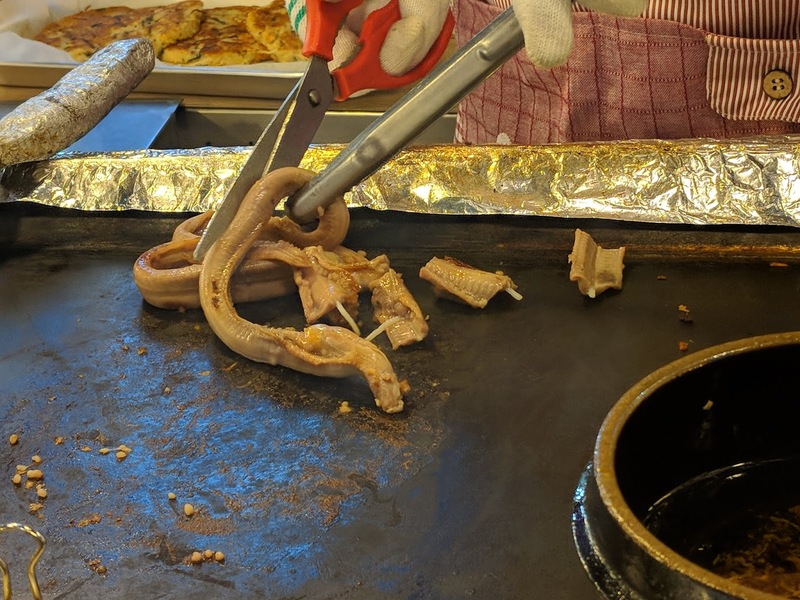 I sat down at one of the stalls manned by an old lady, flipping the pancakes. She looked tired, but still with some make-up on her face, something which I marvel at. If I were to be the one flipping pancakes, I probably will be too lazy to put make-up. The old lady looked serious while flipping the pancakes and her stall was crowded with locals and tourists, judging from the faces and languages spoken. 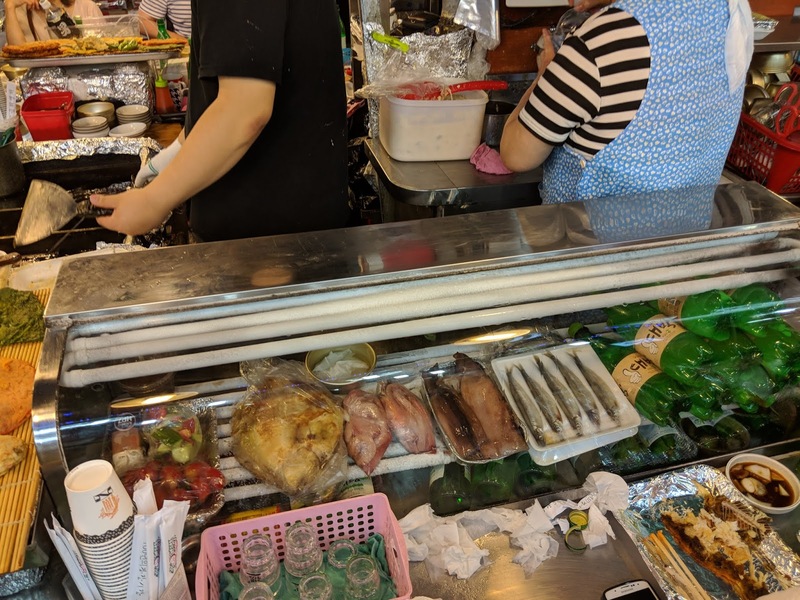 There was a seat available and I sat down gingerly, joining the diners at her stall. The diners welcomed me and were drinking their Soju happily. I did not include the picture of the stall as I am going to write about the only negative dining experience I had in Seoul and I did not want to disrespect an old lady. 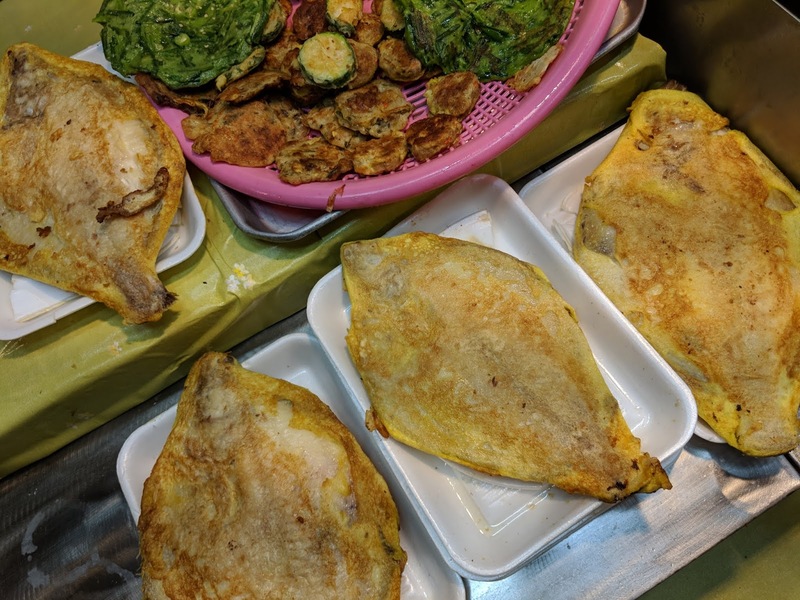 I ordered One Leeks Pancake and One Mung Beans Pancake by using my fingers to indicate "1" and pointed to them. She fried the pancakes for me and included some other fried vegetables which I could not remember what they were. The prices for the pancakes were written. Because of the additional fried vegetables fritters, I was unable to finish my pancakes which were rather huge. Leeks pancakes tasted like a milder version of Spring Onions Pancakes. The pancake mixture was lovely. 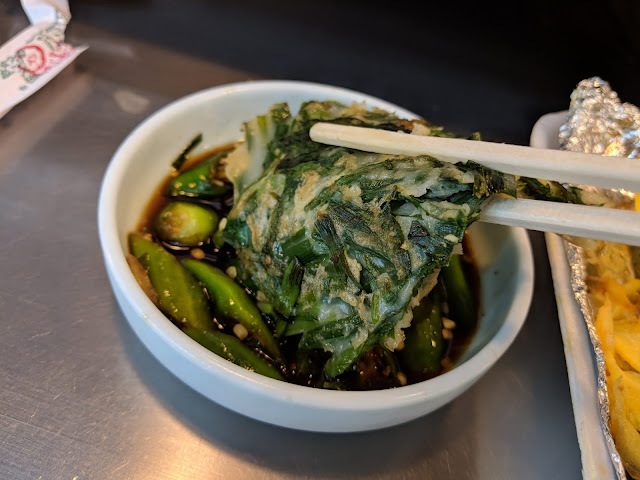 Mung Beans tasted like a sweet version of braised bean sprouts. The star of the pancake dish was actually the sauce. 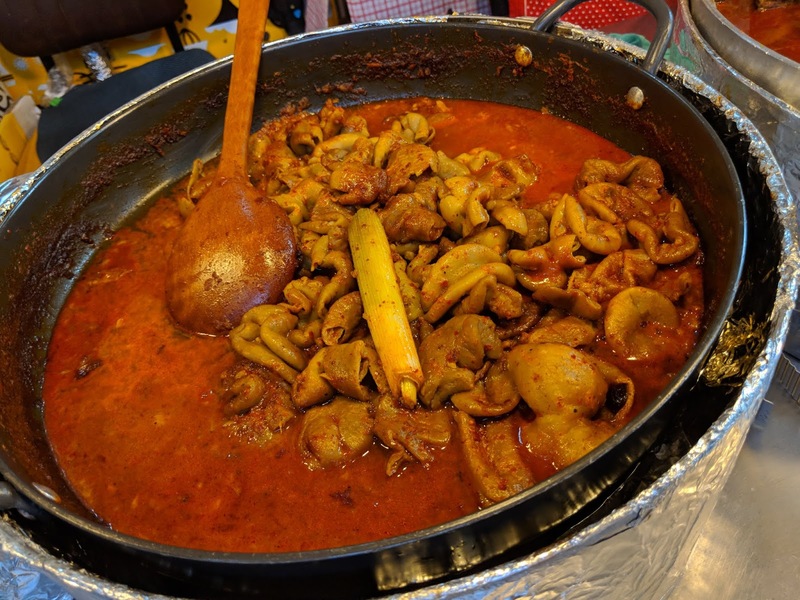 The sauce was sweet, salty and fragrant. I enjoyed both pancakes. Since I was unable to finish my pancake, it was rude to waste food so I asked for the pancake to be packed. I used my hands and acted out the action of wrapping the pancake. She proceeded to take the pancake from me and appeared to understand what I wanted. Then I saw something strange. 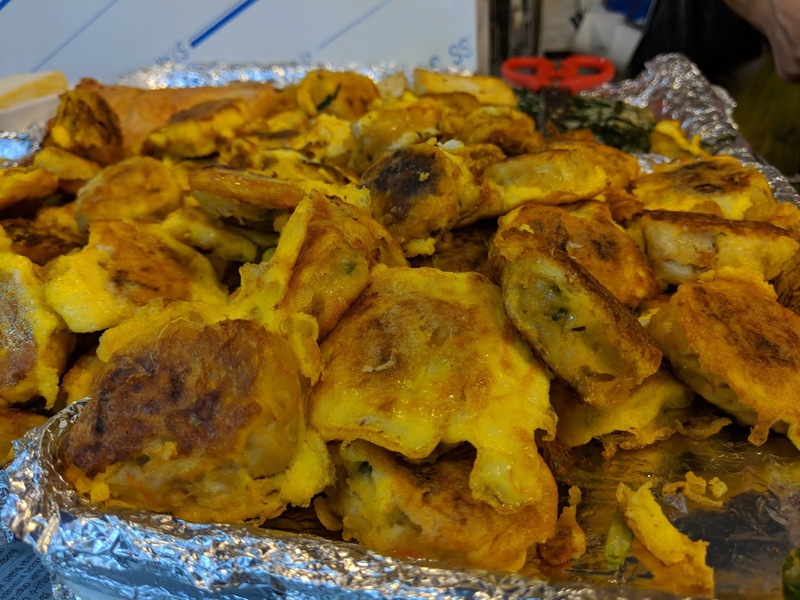 The old lady started to pile additional Leeks Pancakes out of nowhere and wrapped everything up with an aluminium foil and placed everything in a plastic bag. 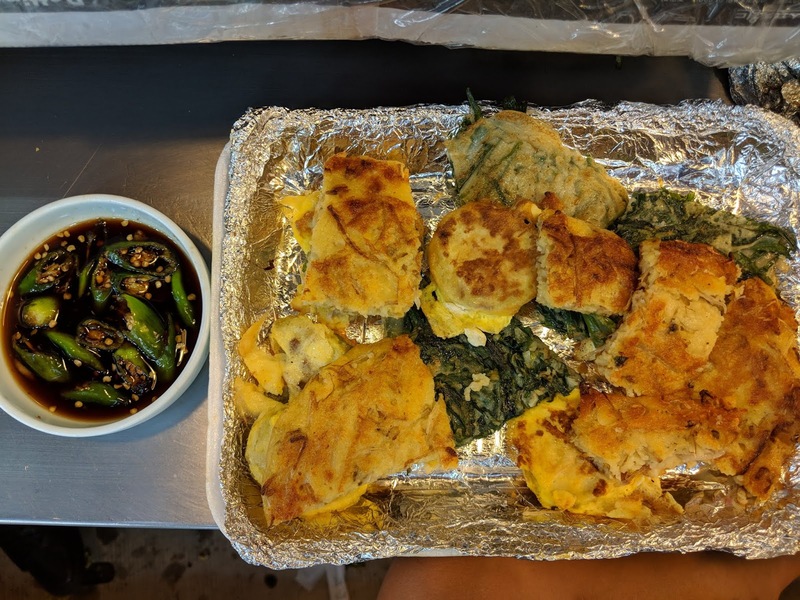 The additional Leeks Pancakes were cold and not fried on the spot, unlike the one that was partially eaten by me. I was charged way more than the One Pancake that I had initially ordered. The price I paid was more than any Korean restaurant that I had eaten and they were for Leeks Pancakes. She did not understand English, obviously, so it would be difficult to explain about the overcharging. I decided to walk away, telling myself that it was okay since she was old, tired looking and probably desperately wanting to sell her Leeks Pancakes. My advice to you: If you see any stall lady giving you additional food that you did not order, please indicate a firm NO. 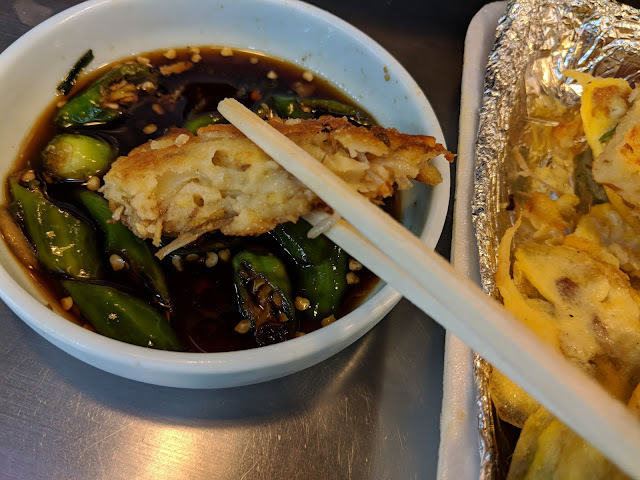 After stuffing myself with the Leeks Pancakes, I really had no appetite for any more food but I managed to take some shots of the food available! This fish is very popular. 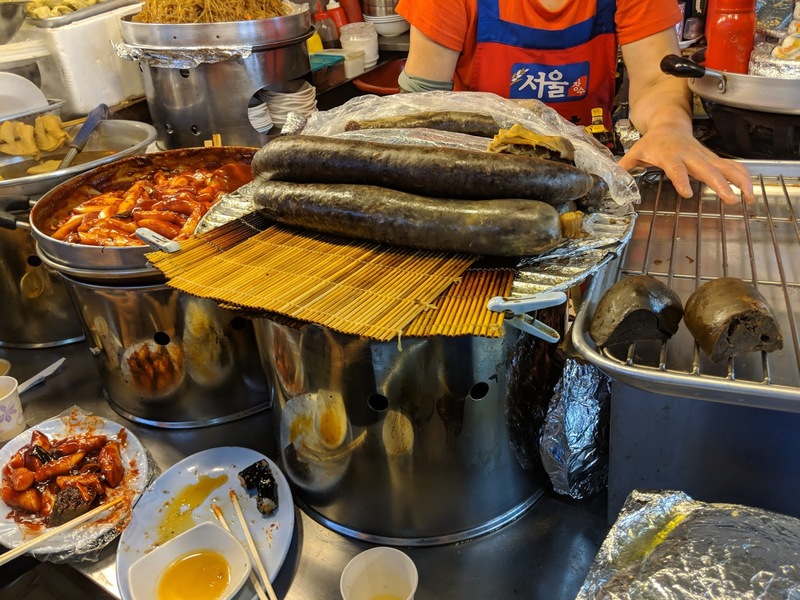 I love pig intestines but blood sausages are way out of my league. How do they taste like? I have an aversion to blood products, always allowing my imagination to get the better of me. Blood carries a lot of impurities but so do intestines... oh well. 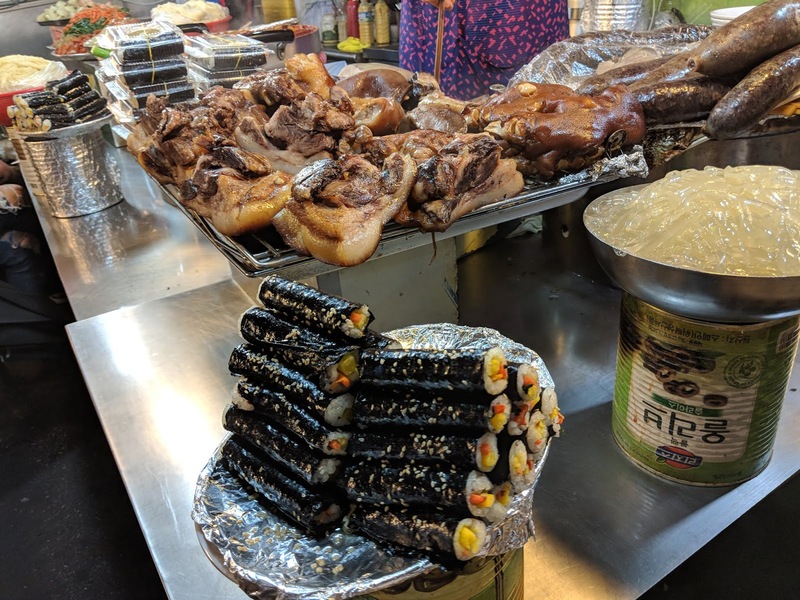 Korean Rice cakes and Gimbap! If food stalls are not for you, there were plenty of restaurants at the sides, selling all kinds of Korean cuisine. 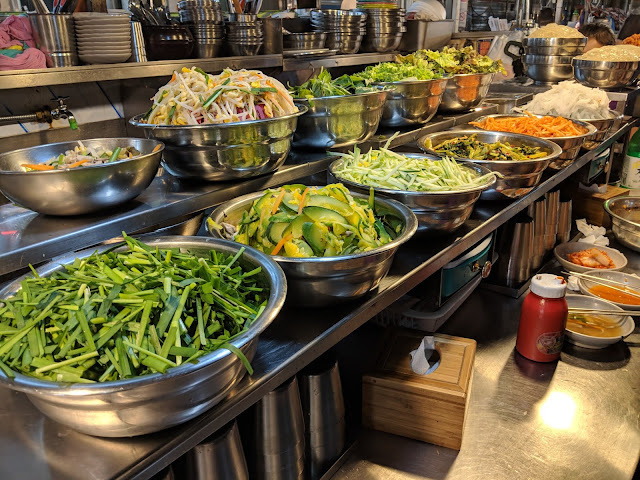 I learnt that dining at Korean restaurants at times could be cheaper than eating Korean street food. 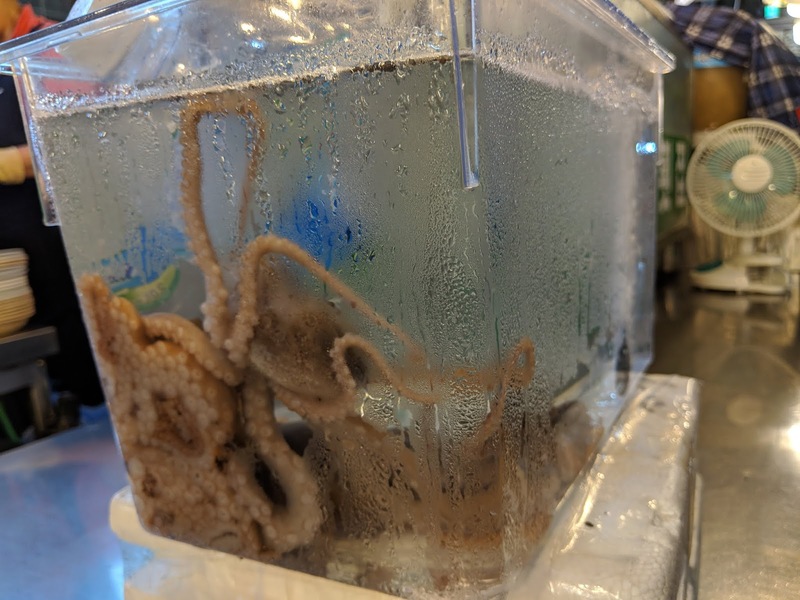 Gwangjang Market also sells Live Octopus, known as San-Nakji. Nakji refers to small octupus. As I had been to Noryangjin Wholesale fish market the day before, I realised that the Live Octopus at Gwangjang costs more than twice the amount of the ones sold at Noryangjin! Gwangjang is popular with locals. 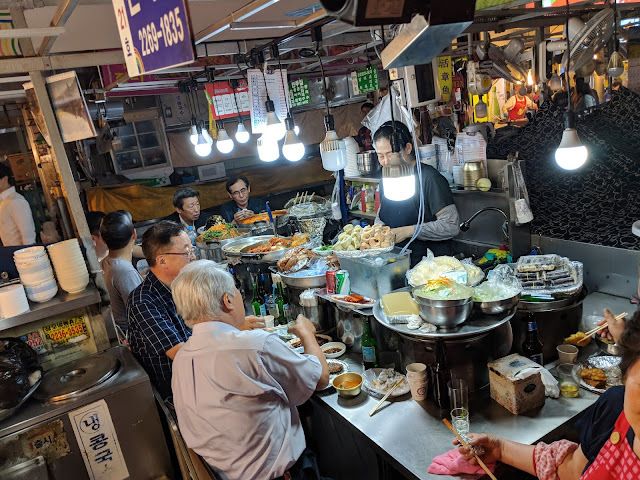 It was actually quite a sweet sight to behold, watching people from all walks of life, gather round a stall and dine together. Koreans are more reserved as compared to most Westerners or South Africans based on my travelling experiences. 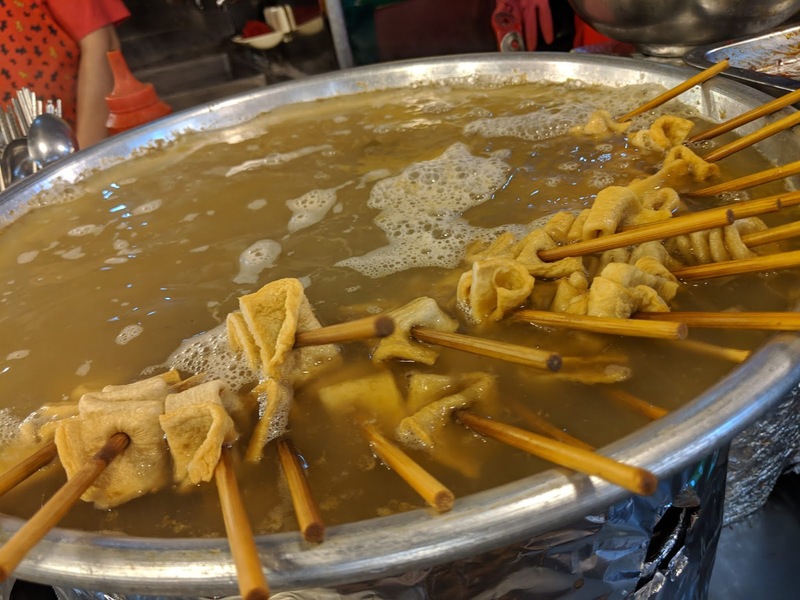 They usually keep to themselves but are friendly when asked for small favours such as directions, similar to Singaporeans. Seriously, it is better to travel in pairs or more in Seoul. The food portion was too huge for me! The crowd had left me a little dazed. 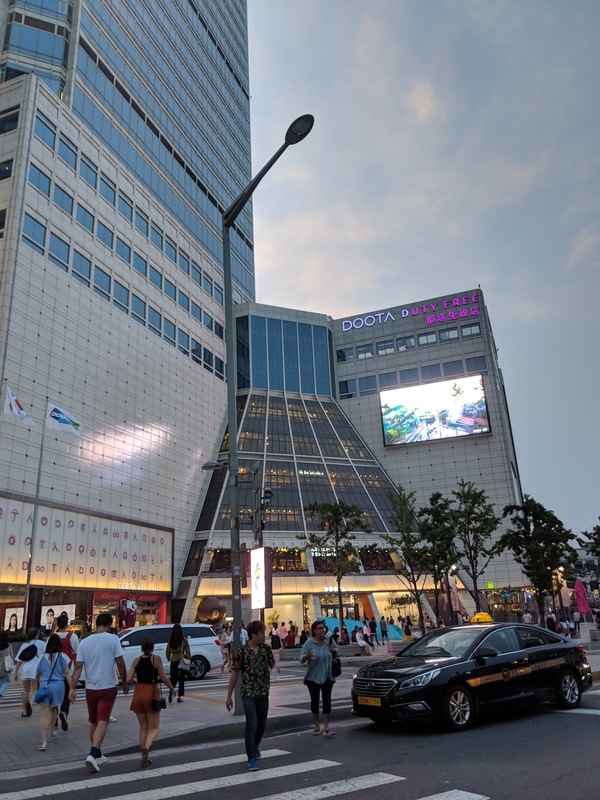 Nonetheless, it was time for me to check out Dongdaemun, which was just a Metro stop away! Dongdaemun is a shopping district and I emphasize LATE NIGHT because I was shocked that some of the shops opened as late as 2a.m.! I even saw ladies pulling their suitcases while shopping or crossing the road. 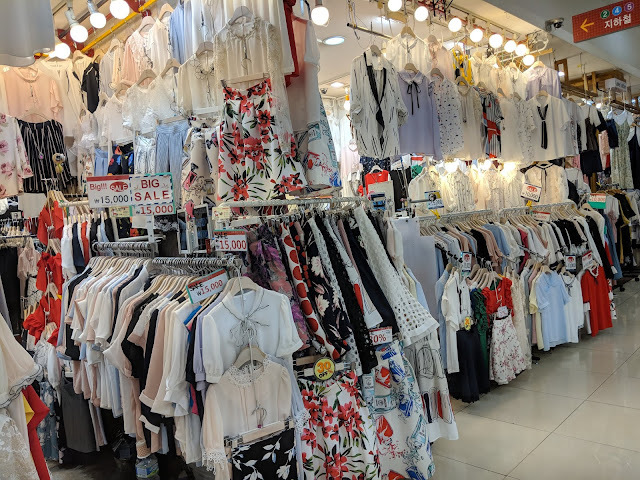 It was an interesting sight to behold - retail therapy. Anything that takes you away from the thing that you do not want to think about is worth considering but too much of anything is not too good for the soul or in this case, the wallet. Haha. 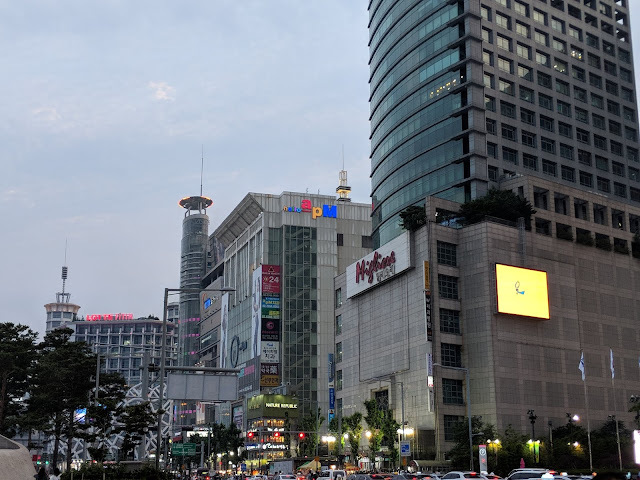 When I exited from the Metro Station, the first thing that caught my attention was Pyounghwa (Pyeonghwa) Fashion Town (서울 평화시장) . 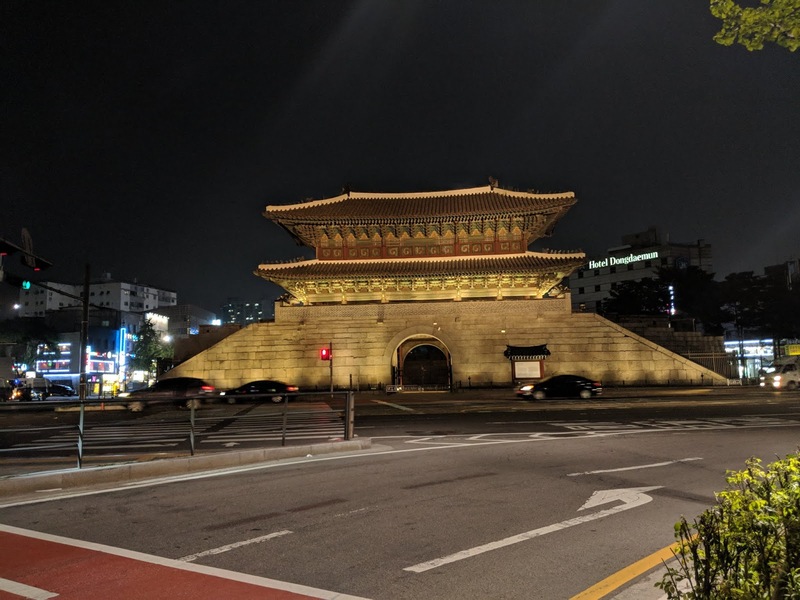 For more information on Pyounghwa, click here. I was exploring the area of Dongdaemun when I chanced upon a beautiful church. I love the old style churches. 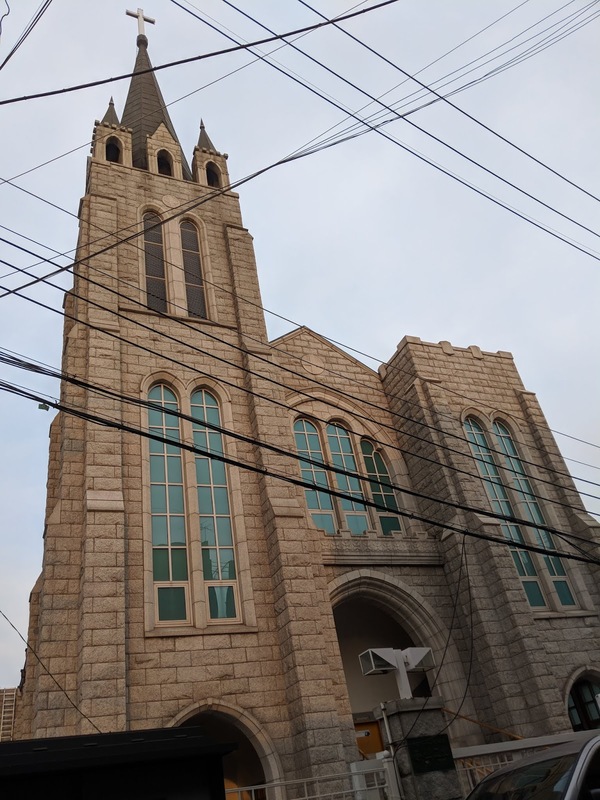 For more information on Christianity and Korea, please click here. Dongdaemun has many big shopping malls as well as shopping streets. The price range varies a great deal. For bargain hunters, there are many clothing available for around S$15 to S$20. 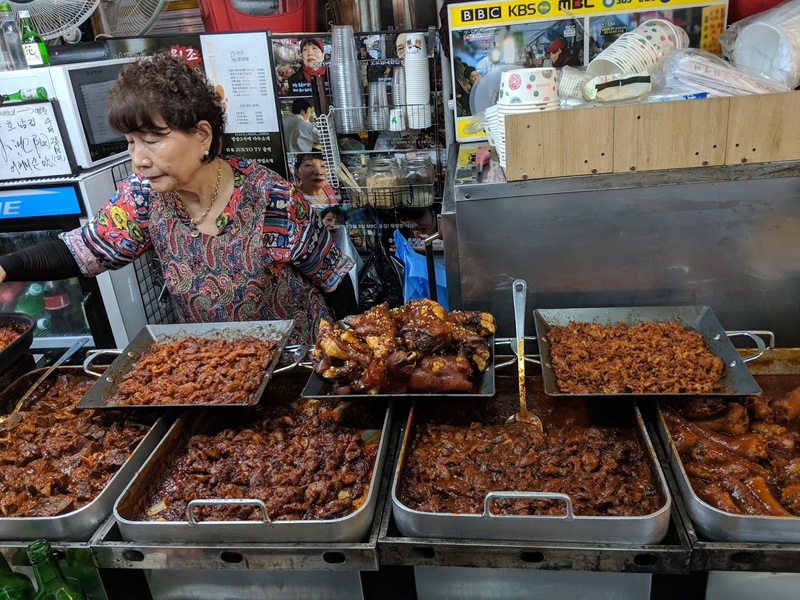 I was chit chatting with a Korean lady at a stall and I told her that I was feeling very tired and drained. She asked me if I had tried Korean Sauna. I shook my head and my eyes lit up. She took the cue and began to tell me animatedly how good it was. She then revealed the best thing I have ever heard on the trip - there is a Korean Sauna and Spa right in Dongdaemun. 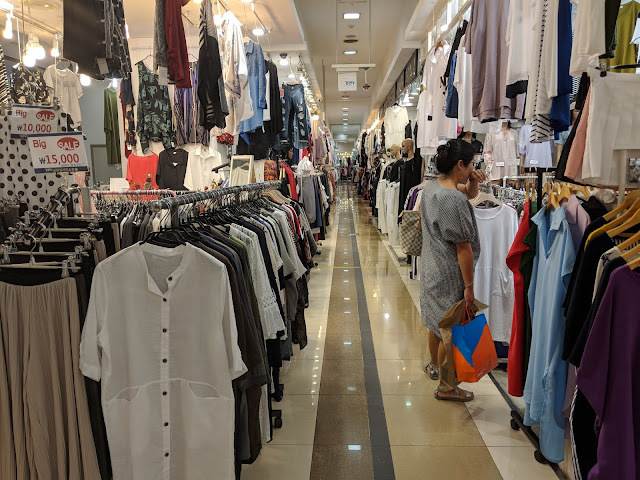 She was really nice as she led me by the arm to the side of the road whereby I could get a view of the shopping malls ahead of me. She pointed at a general direction and told me that the Sauna was located there. At that point in time, I did not know how to ask her for specific directions. Which building? Which level? What is the address? 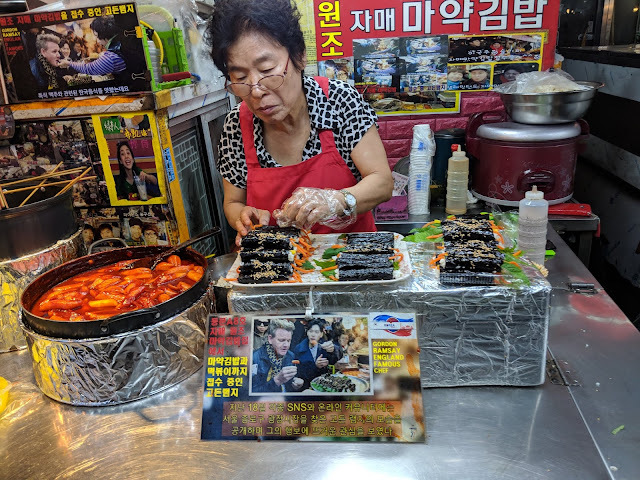 I thanked her and began my journey to find the Korean Sauna. 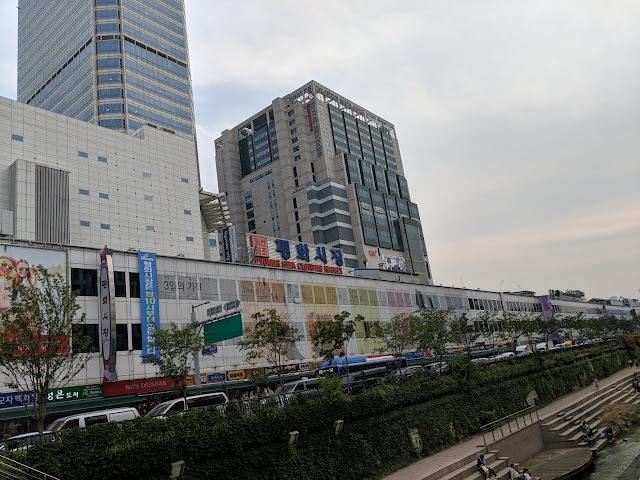 This wonderful encounter led me to the building called "Good Morning City Shopping Mall". Recently, I am reading a book "The Science of Meditation" and one of the key takeaways was about us having different levels of consciousness. 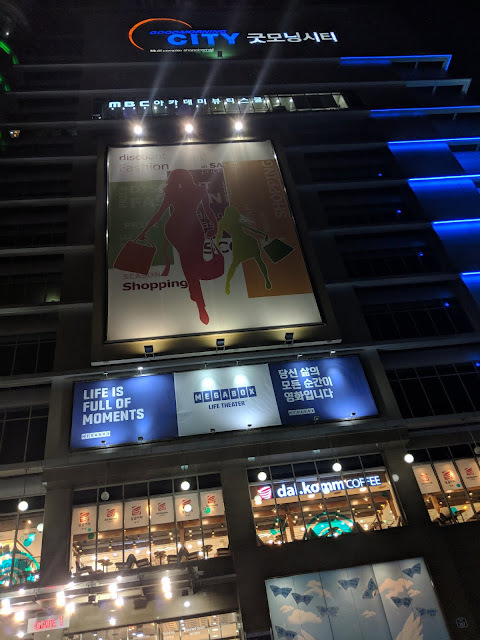 When I saw "Good Morning City Shopping Mall", my sub-consciousness has kicked in. 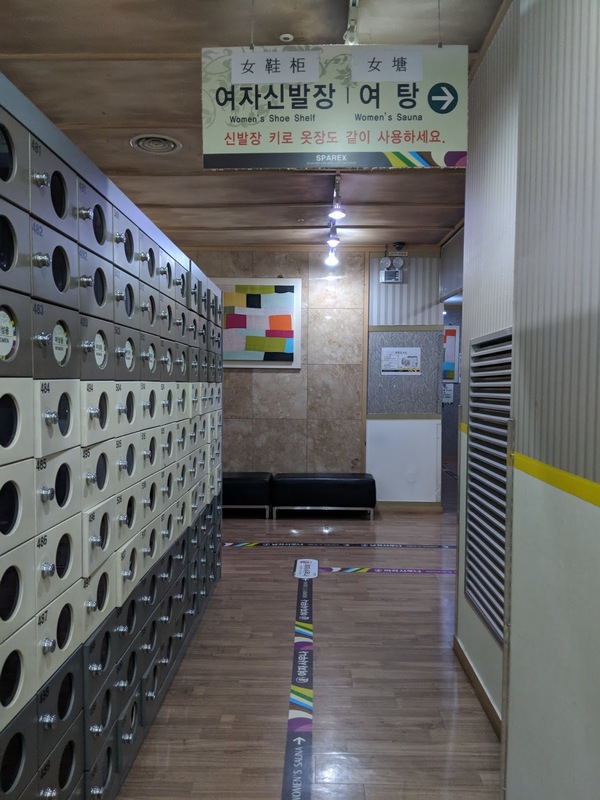 I knew somehow, that the Korean Sauna was inside this building! 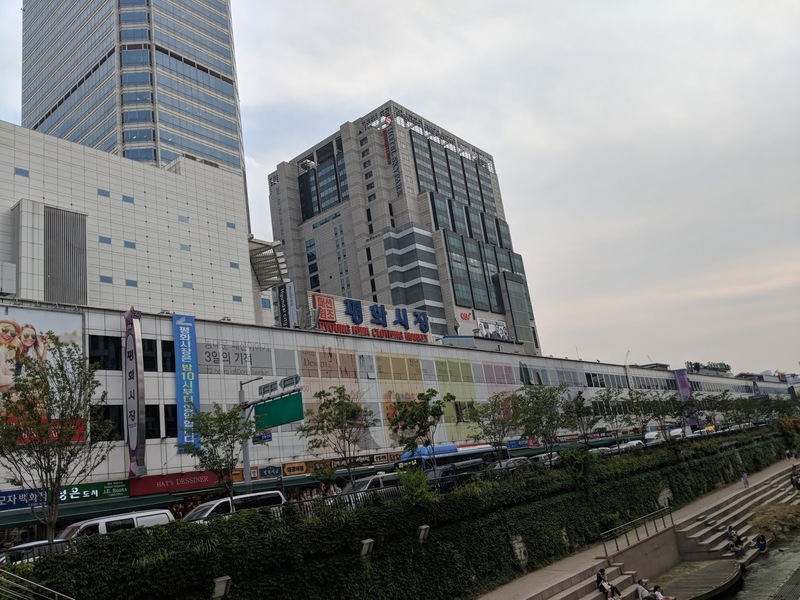 As I stepped into Good Morning City Shopping Mall, I was ... dumbfounded by the opening hours and the sheer size of the mall. For more information on the opening hours, please click here. The variety of clothing and the reasonable prices certainly put Platinum Mall in Bangkok to shame. 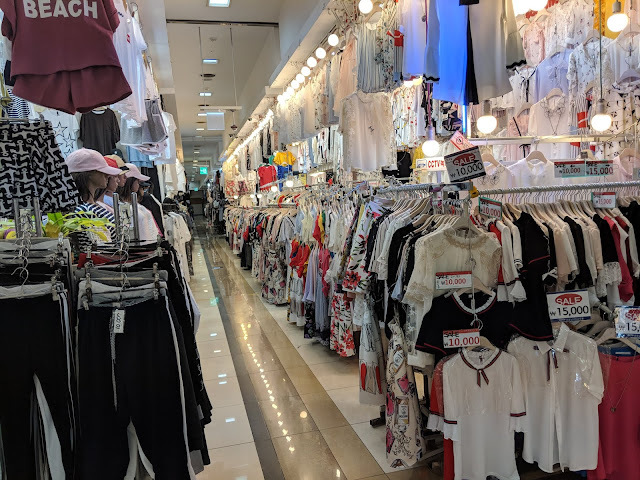 This was way better in terms of shopping space, prices and designs especially if you are into Korean style. As my intention was to find the Korean Sauna, I did not shop. 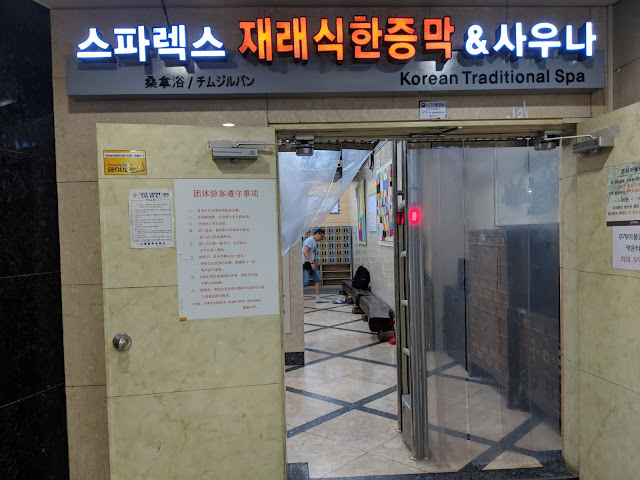 I asked a shopkeeper if there was a Korean Sauna in the building. My heart exploded in Sakura blossoms as he uttered a resounding YES! I was beaming inside, proud of my sixth sense and filled with gratitude towards the Korean lady who had directed me to this spa earlier on. The shopkeeper kindly pointed me to the lifts and told me to go to B3. The spa is located at B3 and B4. The receptionist was not the friendliest person on Earth and the people there expect you to know what to do. They will react strongly if you do not know what to do, for example, not walking naked or wearing shoes at the wrong places because they value hygiene. Therefore, I am going to write a step by step guide for you so that you will be able to enjoy the place like a veteran. At the reception, I was given keys and a set of orange pajamas. I did not know what to do and proceeded to the Women Sauna. I was instructed firmly by the patrons not to wear shoes. I did not know where to put my shoes and a kind tourist led me back to the Shoe Locker at the receptionist. I had to keep all my clothes in the locker and strip to nothing. There were many naked bodies walking around the entire hall. At this point, photo taking is of course, not allowed. There was a short distance to walk while being totally naked, depending on the location of my locker. Initially, I was feeling awkward. After a while, I felt more at ease. Before soaking in the hot baths, I had to take a shower using the soap provided. Thank goodness, I could shower while standing. In Japan, I had to shower while seated on a stool. It was quite difficult to shower properly. There were a few baths at different temperatures. As I soaked in the water, I felt the warmth relaxing every inch of my muscle. The baths were amazingly relaxing. I absolutely loved them! This was the best part! At a corner of the Hot Baths section, there were a few plastic pink beds and each plastic bed was occupied by a naked customer lying down being scrubbed down by a naked female staff mostly in their late forties or fifties. I highly recommend spending money for this as the scrub felt very good. Dirt came off the skin effortlessly. I did not know why the female staff were not wearing clothes as it could be quite cold standing there, scrubbing customers. After the scrub by the female staff, I had to take another shower. I exited the Hot Baths section, naked. I scurried to my locker and quickly put on my orange pajamas. There were coin-operated hair dryers available for a small amount. Thank goodness I had some coins. After showering, I proceeded downstairs to the Massage section. 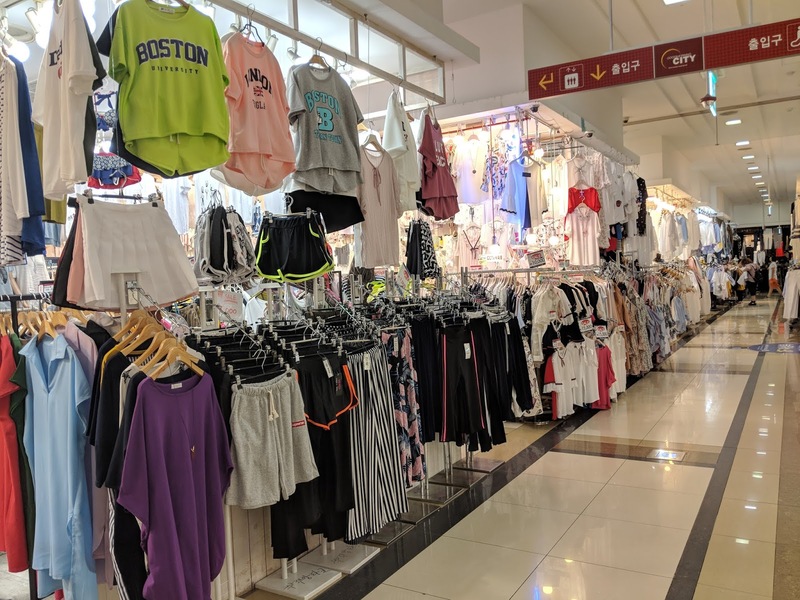 This section was accessible by both males and females. I had booked a 60 min full body massage before entering the Hot Baths. The massage by the female masseur was one of the best I ever had. I felt very relaxed. There was a large living room with a television for people to chill and sleep overnight. I was not so adventurous to spend the night there so I went off after lying down to chill out for a while. I saw groups of people huddled in a corner to play cards or just to chit chat. I also saw many couples sleeping side by side together, just enjoying the quiet and relaxing moments. I enjoyed myself so much that I returned on the last day of my trip to experience the Korean Traditional Spa again!